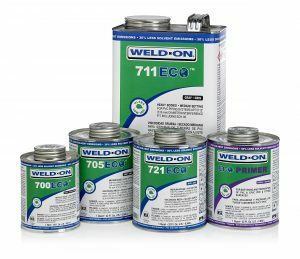 Weld-On introduced the ECO Series of ultra low VOC solvent cements and primers for irrigation, industrial, pool and spa applications. The ECO Series’ unique, proprietary formula achieves strong bond strength in plastic pipe joints just like Weld-On’s current cements but with 30% lower solvent emissions and odor. With this new environmentally-friendly formula, the ECO Series has ultra low VOC content that is far below the current SCAQMD Rule 1168 VOC limit and will also meet SCAQMD’s proposed VOC limit set to be effective in 2023. The lower rate of solvent emissions and reduced odorous fumes from the ECO Series contributes not only to a better environment but also to improved working conditions for installers. 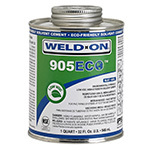 Weld-On® was first to develop an eco-friendly solvent cement in the industry. The 905ECO™ has up to 15% less solvent emissions and reduced odorous fumes than current solvent cements in the market. The significant reduction of vapors during product usage makes for an improved workplace environment. This patent-pending new technology has a proprietary compound that greatly increases bond-strength and uses significantly less aggressive solvents and yet, the 905ECO performs equal to or better than the best standard solvent cements. Weld-On patented the SuperSwab easy-to-grip applicator (Patent No. 8747004). This versatile swab contains two parts. The reusable holder has adjustable length and dual cap design that fits quart and gallon containers. The disposable swab tip is shed-resistant and designed for smooth, full application of cements or primers. Weld-On became the first company in the industry to offer environmentally-responsible, all Low VOC solvent cements, primers and cleaners, and completely phase out regular VOC products. All Weld-On products now meet the requirements for Low VOC (Volatile Organic Compound) emission limits, established by the California South Coast Air Quality Management District (SCAQMD) – one of the most stringent regulations in the U.S. Use of Weld-On Low VOC products can also qualify contractors for one credit toward the U.S. Green Building Council’s LEED v2009 certification for green building. Weld-On Structural Adhesive series was developed and launched. These advanced, patented, high-performance methacrylate adhesives are widely used in transportation, marine, and industrial applications. Weld-On introduced 724. It was the first high strength solvent cement for chemical resistant CPVC plastic joints in the market and formulated for use in a variety of harsh chemical applications such as hypochlorites, acids and caustics. Weld-On formulated and introduced the first Low VOC (volatile organic compound) emission solvent cement in response to growing air quality concerns. Our low VOC product line meets one of the most stringent air quality standards in the country and most preferred by professionals. Weld-On developed color-match acrylic adhesive for bonding solid surface countertops. IPS Corporation pioneered the solvent welding technique and patented Weld-On solvent cement for use on plastic pipe and fittings. This technique and product revolutionized plumbing in the United States by making plastic pipe installation easy, time-saving and convenient. Weld-On developed the first clear, reactive acrylic adhesive that met U.S. Department of Defense military specification (MIL-SPEC) for use on aircraft canopies. This reactive adhesive technology led to the development of other innovative adhesives which are the standard for bonding acrylic, polycarbonate, vinyl, ABS, PVC, PETG, butyrate, metal and other substrates used in many industries: POP display, aquarium fabrication, sign building, etc.